At the fall shoot I got a chance to try Sole's Accu-Shot Atlas bipod and was impressed enough to order one for my bolt action precision rifle. Well I got it in late last week and between hunting and family stuff I just slapped it on the rifle and threw it back in the safe. Today I took the rifle out to verify my loads for the opening of gun season for deer next weekend and WOW what a difference over my old Harris. I opted for the ADM throw lever version so that I could quickly move it between rifles. At first I was hesitant because they are not cheap and after shooting it I know why. They are solid as can be. Adjust more easily than the Harris and Harris clones. All models have tilt and pan and allow for a variety of accessories such as leg extensions and different types of feet. When I got to the range the first thing I needed to do was unload my muzzle loader so there is only one fun way to do that right? I did have a Harris clone so I slapped it on the ML and paid close attention to the amount of slide on the table. Our shooting benches are semi finished plywood that has just been painted. Nothing fancy and nothing really to grip on. With just a little force the bipod would slide back and forth making it difficult to preload the bipod for a shot on this surface. Because of this when I go to my range I normally go prone on the cement and I get a bit better grip with the bipod that way. To really load into it though I have to drop the front feet off the edge and into the gravel and dig a small area out for them to really stick in. After shooting the ML I moved over to my 700 PR and could tell a difference right away. 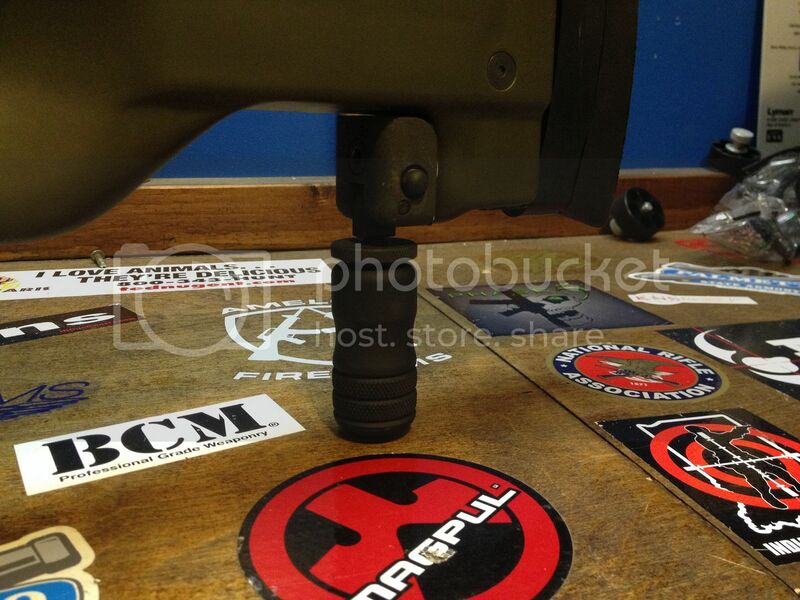 It took maybe 3 times the force to slide the bipod forward on the bench. Much better grip on that surface and on cement. Now to do some shooting. Loading the bipod I could actually stay on target well enough to watch my impact at 200 yards and farther at 20 power. There is always going to be some muzzle movement but I was amazed at how fast it recovered to within 2 mils of my target. It also seems more sturdy during shooting with much less wobble. Advantage of the Atlas over the Harris in my opinion anyway. The legs lock into place over a 180 degree sweep every 45 degrees. If you have a shorter barreled rifle and like me prefer the bipod way out front the legs can be swept back for storage/transport to reduce overall gun length. Both the Harris folded and the Atlas folded forward sick out about 2-3 inches past my muzzle. Another advantage is you pretty much have you option of feet selection depending you your shooting surface though they are not cheap. Replacement feet will cost about 40-50, that is as much as a Harris clone by Caldwell or Blackhawk. Comparing the cost of each side by side a Harris 6-9 HBRS (tilting version) will run you 106.50 from Harris. The Harris RBS (allows QD and panning) is another 87.95 for a total of 194.45. The Atlas with ADM mount that does all of the above in one package is less than $100 more at 279.00. 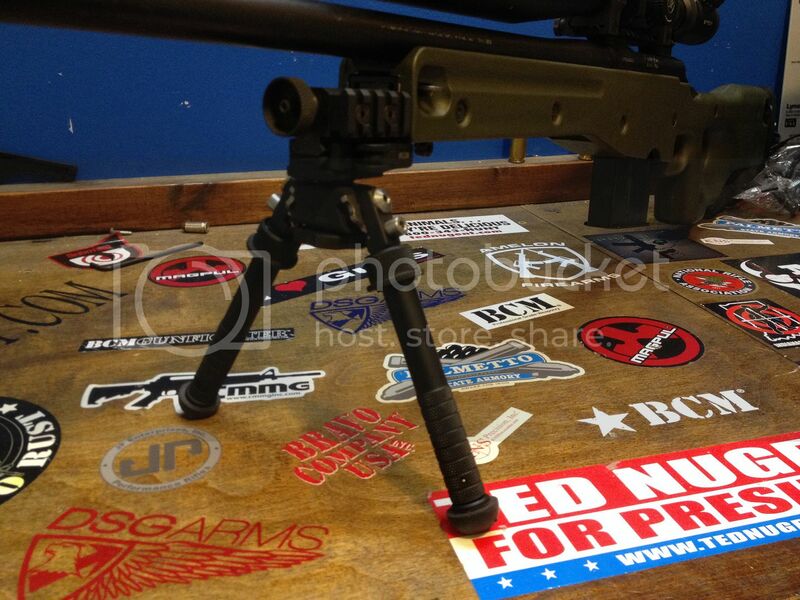 To show off the bipod here are a few pics. Using this bipod from the bench today I was able to put down a 1.5 inch group at 205 yards with hunting ammo. Could I have done it with the Harris? Maybe but on the surface I was shooting on there was no way I was going to see the round impact with the Harris without having something to bace the bipod on to keep it from sliding. If you are building a precision rifle or are just not happy with some of the other options from the leading bipod manufacture check out the Atlas, I am glad I did. In the effort of full disclosure, I blame this purchase on SoleEagle. Blame it on Sole too. It makes me feel better. Yep, Sole is the initial instigator here. Red just passed it on. I want one of those too. Why do you do this kind of things to your friends? Hey I may be one of the first with this sweet bipod but I can and will blame outkast. All his fault. We should all be in politics. We have no problem redirecting blame. The fault has now fallen upon Outkast. Click the link on your own. Not responsible for you making purchases. It IS his fault, after all.